This is the second part of a three-part series. Part one is here, and part three is here. In 2007, the year that Thein Sein was named prime minister, the Burmese junta faced its worst crisis in nearly two full decades of iron-fisted rule. Thein Sein was already Burma's acting prime minister when the monk-led Saffron Revolution emerged as the most serious display of popular unrest since the nationwide pro-democracy uprising of 1988. However, it wasn't until after the death of his predecessor Soe Win on Oct. 12—just weeks after the crushing of the protests—that he officially became the last prime minister of the former junta. Despite his rise through the ranks of the regime, Thein Sein continued at times to demonstrate a sensitivity that nearly all of his fellow generals lacked—a trait that seemed at odds with his position as one of the leaders of a junta that had gunned down unarmed monks and demonstrators. Although all of Burma's rulers profess to being devout believers in Buddhism, only Thein Sein seems to have the calm, patient temperament associated with the country's dominant religion. Married to Daw Khin Khin Win and the father of two daughters, he is said to lead a quiet, “exemplary” family life. “One of his significant leadership abilities is that he leads his family by example. No one in his immediate family has been accused of bribery or corruption. As a pious Buddhist, he practices metta [loving kindness] when dealing with others, and always tries to avoid disturbing things and people around him,” said Ko Ko Hlaing, a former army officer who is now a presidential adviser. Even in his public life as a member of one of the world's most hated regimes, Thein Sein showed a conscientious streak that distinguished him from most of his colleagues. For example, when Cyclone Nargis slammed into the Irrawaddy Delta in May 2008 and Than Shwe’s government prevented significant amounts of foreign aid from reaching affected areas, Thein Sein was the first top general to travel to the delta and meet the victims. It was at this time, when Burma was still reeling from the heavy death toll from the worst natural disaster in its recorded history, that the regime pushed through a referendum on a constitution it had completed the year before that granted the military a permanent role in the country's political affairs. The 2008 Constitution, which was drafted by the military in a process overseen by Thein Sein, was approved in the sham referendum. The announcement of the results then kicked off a long period of speculation over who would lead Burma once a general election was held. During this time of uncertainty, Thein Sein emerged as the international face of the Burmese regime, attending both regional and international summits. In 2009, when he traveled to the UN General Assembly in New York to defend the junta and its political “road map to disciplined democracy,” diplomats noted that he was quiet but persuasive. Thein Sein was also the top Burmese official to receive US Assistant Secretary of State for Asia Pacific Kurt Campbell on his visit to Naypyidaw. However, it was Gen Thura Shwe Mann who was first tipped to become president—while he had no international experience with the West, he did have close domestic ties to junta business cronies. Gen Tin Aung Myint Oo was also mentioned as a possibility—the hardliner was battle-hardened and loyal to Than Shwe, but was also known to be one of the most corrupt generals in the regime. In the end, Than Shwe made the safe choice and selected Thein Sein, a man with international experience who was personally untainted by corruption and human rights abuses. In addition, Thein Sein had no internal power base that posed a threat to the dictator’s personal or financial security. But despite Thein Seins’s relatively clean reputation and the undeniable progress that he has overseen in recent months, there are still legitimate questions regarding Burma’s fledgling president due to his past prominence as a junta general, uncertainty about whether he is actually the one calling the shots and the fact that the most meaningful and irreversible reforms are still only being talked about rather than enacted. 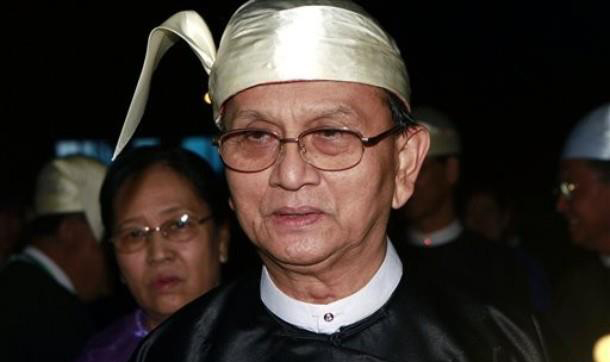 It remains unclear just how much authority Thein Sein really has in the new government. You don't even know how old I am and you are insulting the young people. U dont even deserve a title of "MG". As it just proves u r still a kid who is WET behind the EARS & still smell of ur MOTHERS" milk. Having a conversation by insulting a person is VERY CHILDISH. You wrote'' Hear Hear Htoo"-and then Mytta,SayDa Nar and Kaung Taw Mingalar. I felt that it was just like " Angle words from a Dog's mouth" (Kway pa sut Ka Nat Saga)as a Burmese saying gose. You accused me of a coward without any proof. It is a shameful act of a true coward. I will nevr run away from truth and a good cause as you have accused me. The electron dam project of Kachin.But we still need to watch out of his behind for whom still take control of him and the government. As u say freedom of experssion is ur right.So u must b an 1 eyded JACK. U want 2 write & expeess ur opionions,but cannot accept critisism ur self. Its people like u that have PROVEN my point every time. Being cowards,running away fr anything & everything. Just proves that u r 1 of those cowards that ran & ran as far away as u could. When the truth is written & spoken like a Barking dog that does not bite, but makes a lot of noise 4 no reason. & hoping that u will rid by hoping it 2 give it 2 any1. I wish u Myit ta, say da nar,kaung taw mingalar,& especially how 2 respect ur elders.. U nd 2 learn alot. David is intolerance to critisizing to Junta. He should understand that freedom of expression is our right. I understand his anger on the some bogus asylum seekers and bogus refugees. Anyway it was better to cross border than being starved or tortured. His travel records to Burma were only good for redemption of air tickets. Moreover his writing stye was more like a message on i pad or mobile phone on Valentine day. he should not be making fun on it. Hopefully he is not an astroleger who prefers numbers even on writing comments. He seems to have Scabies or Fungal skin on his foot as he was seeking help his foot .I advised him to see Dermatologist before contagious to other. He has shown his leadership and transformed myanmar political landscape in very short time. We only worry that he will face with internal power struggle as the hardliners may not happy with his leadership. His health condition is said to be not so sound. Let hope and share our Metta to him everyday for him to be healthy and continue this reform successfully. Predident U Thein-Sein is a reformist. It is no accident that Ashin U Than-Shwe has delegated the responsibility of reforms to U Thein-Sein -UNDER GUIDANCE! 1." Read this Irrawaddy news & u will only find NEGATIVE VIEWS & OPPIONIONS. Unsatisfied,disgruntal,wingers 4 every little thing." THAT PROVES HOW BIASED IRRAWADDY IS. 2. "Why is it that Myanmar people always have NEGATIVE opionions no matter what is being done." NO, not Myanmars, only a motley bunch of slave-like Myanmars and hybrids. 4 once I can say that here is a person with common sense. Who understsnds that change is taking pl & Thein Sein is trying..I say trying 2 do what ever he can 2 make a change. Read this Irrawaddy news & u will only find NEGATIVE VIEWS & OPPIONIONS. Unsatisfied,disgruntal,wingers 4 every little thing. Why is it that Myanmar people always have NEGATIVE opionions no matter what is being done. Even now, that so much change is taking pl u still cannot pl any 1.
claim 2 have 2 go bk 2 the country after 20/25 yrs 2 help. HELP MY FOOT. I say if they had the GUTS why did they not go bk be4 now. And b 4 any 1 tries 2 LECTURE me, may I say that I have bn 2 BURMA/MYANMAR since 1960 @ least once a yr some yrs twice.I was there when NE WIN took power fr U NU, the BURMESE/CHINESE riots,U Thant's body return 2 then Burma followed by the students riots 4 his body & where he should b buried.88 riots, 2 cut the story short I was there when NARGIS struct, the Saffron Riots. So all u EX PATS, eat ur hearts out,Leave the Politions & the country 2 sort its self out.U never gave help then, so don't MEDDLE NOW, they don't need ur help. It's MYANMAR people, NOT BURMA. Get it through ur thick skulls. HTOO may u b ENLIGHTENED 4 ever more. I believe that U Thein Sein is the first ever reform-minded military leader. And selecting him is the only good thing ever done by General Than Shwe. The road ahead for U Thein Sein would be bumpy with all the bad legacies left by the previous juntas. The sensitive issues inevitably awaiting his leadership ability to be tested include the issue of Buddhist monks in politics and the land disputes between farmers and big companies. This is time to draw a line between the Sasana and politics as well as to fairly solve the land disputes which need to be urgently solved for the sake of promoting the country's economy. I hope U Thein Sein could be able to handle these problems bravely, impartially and level-headedly. I wish him success in his democratic reforms. Burma does not belong to the military, or to business cronies in any form, or China, or any other nation or lobby. Aung San Suu Kyi was the rightful elected leader of Burma. She has given her approval and trust to Thein Sein at this time of transition, and the by-election will show what is actually happening. The nation will then have to move towards a real election slowly, there is no other credible choice. 'development' should be done as the will of the people, education and health care first. Ceasefires in all areas should be immediate and final. Perhaps all the soldiers can return and help in their villages. There can be no tricks, or Burma will descend into chaos, as the world can literally see everything now. China may be invited along with all other nations to help rebuild this nation. Singapore banks and Thai investors may need to wait - or look like vultures. "xxxxx...xxxxx....... which jail do I have to go, what about my jewels, my family and my children....etc etc"
So, Sr Gen Than sure will make things doubly sure (Gen) U Thein Sein guard him at the gate, Hm ! Wondering why this is no news about the senior General Tan Shwe was invited by a Senior Chinese Communist member to visit China next week?? Thank you very much Irrawaddy for sharing human face of President U Thein Sein. A person who has clean bill of corruption record, good family life, sympathetic heart and attentive ears can be a good partner with the aspiring democratic icon DASSK toward nation building. Like others, I sill have very bad feeling about successive military junta but it does not mean ignoring positive changes. All Burmese people need to contribute positively towards nation building in this window of opportunity. Just telling blindly “YES” to everything is the culture of doomed BSPP and subsequent junta but telling “ NO or RUBBISH” to everything is not contributing any benefit either. Burmese people should identify the weaknesses, contributing factors and recommendations to help both the President and DAASK towards meaningful nation building in a reasonable timeframe. This contribution can be done by an individual, an organization or a political party through mass media and other official channels. President Thein Sein vision is very clear that he does not want any disturbances while he is making reforms for the sake of the country future. Therefore he invited ASSK to work and join in political process so as to gain international recognition. Now what he wants he got it as ASSK is joining the political process for future Burma. The country future will be bright and international community will have confident to Burmese reforms. But it is assumed that Thein Sein period in Parliament can be very short after making so many amendment of present constitution that has to be supported by military is the final. President Thein Sein continues to demonstrate that he is serous about reforms. People needs to understand that it is important to recognize the steps that he has done so far and encourage further progress in the reform. Recent acts committed by A-Shin Gambira does not help in any shape, way or form. A-Shin Gambira may have been a good lead protestor back in Saffron revolution days. But his lack of sensitivity towards current polictical climate, makes some of us worry about the outcome from his detention. Some may use this as a scapegoat to make things worse instead of making things better. A well written article, albeit a bit too short for a “feature”. Thein Sein has definitely won me over with his actions. It’s so refreshing to have a Burmese leader who isn’t entirely corrupt or incompetent. I sincerely believe he’s our Gorbachev, a product of a brutal regime and yet somehow enlightened and truly cares for the people. It has been so fascinating to follow the latest developments in Burma since he became president. I’m just hoping and praying for his health (he reportedly wears a pacemaker) and that the he along with the reformers in the government would win out in the end. By reading this article Thein Sein is neither a reformist nor caretaker but an appointed president who is a pious. But I don't think Thein Sein is as cunning as Shwe Mann and Tin Aung Myint Oo who are abit uncivilized and guilty to moral dignity. The word "caretaker" reminds me of how Ne Win came to power: U Nu allowed him to rule the country from 1958 to 1960in what was known as the "Caretaker Government". I'm not sure whether what U Nu did was legitimate or constitutional. Although Ne Win voluntarily gave back the reins of the government to the elected parliament (U Nu won the elections in 1960), he staged a coup d'etat 2 years later in 1962 and as we know the rest is history (a military dictatorship). In my opinion, once Ne Win tasted power, he couldn't resist becoming a dictator and without him, Saw Maung, Than Shwe, Khin Nyunt, Maung Aye, Thein Sein would be nowhere! In any case, I hope Thein Sein is more a reformer than just a "caretaker" like Ne Win! Thein Sein is a reformist with ties to the military. For decades, Myanmar was ruled by rather backward looking, out of date, traditional leaders. This kind of old fashioned leadership had caused Myanmar to remain as one of the least developed / poorest countries in the region (if not the world). To get out of this economic shambles and back ward conditions, Myanmar needs forward and modern looking leaders, who have vision for the future, and who understand and listen to the demands of the entire Myanmar people. In the years to come, Myanmar will only have leaders with ties to the military. However, in order to emerge from the shambles as a developing and a truly democratic country, it is very important that the military picks good leaders who can go along well with the needs of the people. May President Thein Sein be blessed with all those good leadership qualities. May God bless Myanmar.